I’m off for a month-long research trip to Buffalo, NY, starting tomorrow. While I’m there, I’ll be doing research for a new project and making the last great push on my dissertation. But I don’t think you’ll miss me much — I’ve been so busy I have a backlog of blog posts just ready for the postin’. And I might find some excellent eats in Buffalo, too. And anyway, I expect you’ll be too busy with the opening of the farmer’s market downtown on April 4, and all the stirrings of spring, to be reading inside! 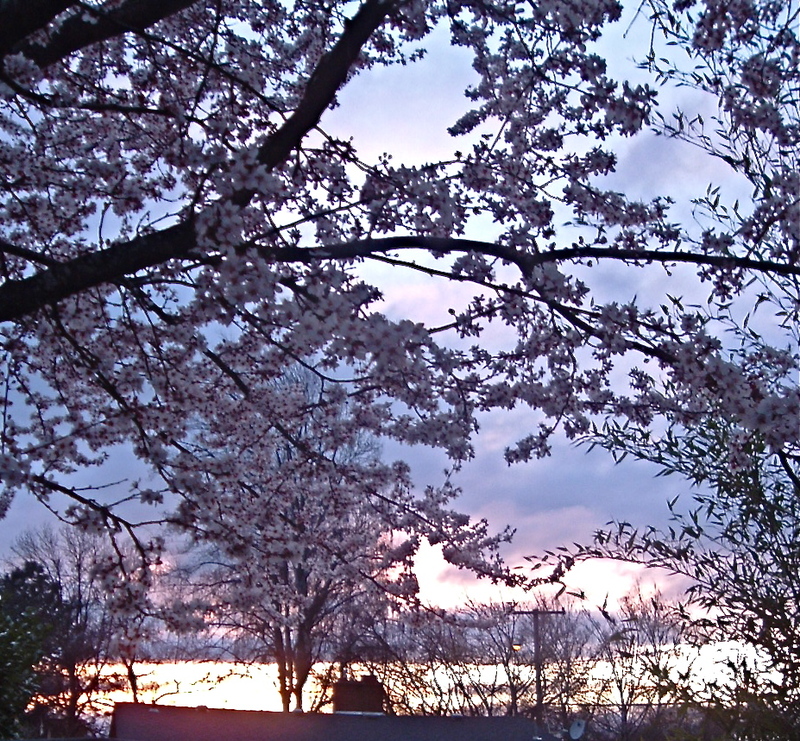 There are many, many things I’ll miss this month, but not really the Great Purpling my yard undergoes each April. Someone (not me) was a big fan of the color purple, and planted all purple and lavender flowers around my house. I have a big swath of purple double irises, lavender and pink rhododendrons, vinca vine under the incense cedar, and tons of grape hyacinth just waiting to burst. Over the years, I’ve tried to counteract the purpling with some red and yellow, but it still takes over. 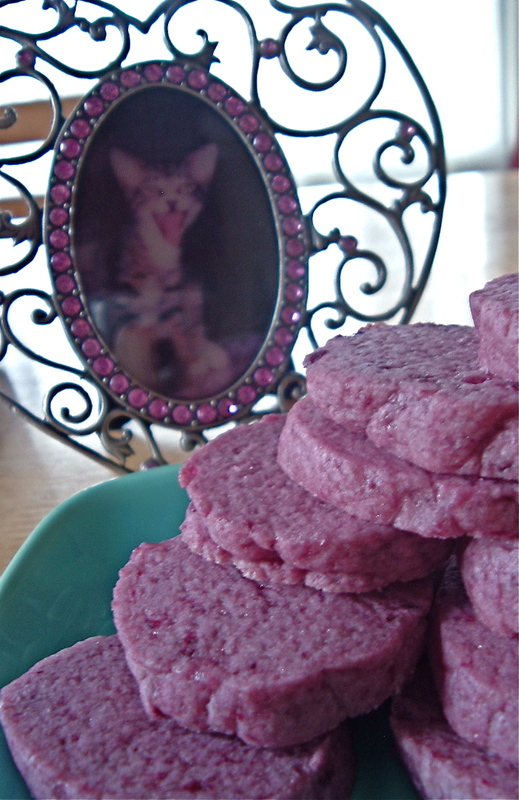 So in honor of what I’ll be missing, I baked up some very purple cookies, using the rest of a jar of blackberry varenye. They’re variations on Poilâne’s punitions again, but with salted butter and some of the sugar replaced by homemade blackberry Russian-style, pectin-free preserves. The blackberry and salt give the cookies a little tang, a little sadness…perfect for leaving home. Allow egg and butter to come to room temperature. Process butter until smooth in a food processor with the metal blade. Scrape down, add the sugar and blackberry varenye, and process until thoroughly blended into the butter, scraping down the sides once or twice. Add the egg and continue to process, scraping down the bowl as needed, until the mixture is smooth and satiny. Add the flour all at once, then pulse 10-15 times, until the dough forms clumps and curds and looks like streusel. Roll dough into log on saran wrap and wrap tightly, chilling in the refrigerator for at least four hours. If you opt to roll out the dough later instead of slice it, form the dough into two equal-sized flattened disks instead. When you are ready to bake, position the racks to divide the oven into thirds and preheat the oven to 350°F. I find parchment paper isn’t necessary, but it makes cleanup easier, especially if you’re using the sprinkling sugar on top of the cookies. You’ll want cookies that are between 1/8 and 1/4 inch thick. Either (A) cut log in slices that are no more than 1/4 inch thick with a sharp, thin knife, or (B) roll the dough out on a lightly floured surface until it is between 1/8 and 1/4 inch thick, and cut with a cookie cutter no more than 2 inches in diameter. Place on cookie sheets, leaving about 1 inch space between them. Carefully turbinado sprinkle sugar on top, if using. It gives a nice sparkle to these cookies, and a touch more sweetness. Bake the cookies for 6-7 minutes, or until they are set but pale. They will lose their sheen when ready. Transfer the cookies to cooling racks to cool to room temperature. Dorie Greenspan says the dough can be wrapped airtight and refrigerated for up to 4 days or frozen for up to 1 month. The finished cookies can be kept in a tin at room temperature for about 5 days or wrapped airtight and frozen for up to 1 month. They won’t last that long. And what better way to celebrate two more short days of bitter rule than a pot of homemade bitter orange marmalade? After two days of chopping, juicing, stirring, stickysugaring, dicing, scraping, squeezing gloopy natural pectin from orange seeds, and playing with napalm ooze, the two batches of citrus marmalade are finished: dark, complex Seville Orange and Meyer Lemon, and light, bright Kumquat and Satsuma. I had a very special request for marmalades last month, so I brought home citrus from Berkeley Bowl. The poor things languished while I had my car incident in San Francisco, and the struggle to get caught up afterward. Then, as luck would have it, I spied some perfect kumquats at Market of Choice the other day, looking much better than the moldy old ones at Berkeley Bowl (?!? the local deities will forgive me), so I suddenly had twice the work. This is my life. I complain. But still I don’t change. Can’t change? Won’t change. Yet. Anyway, I don’t have anything fascinating to report, other than it takes forever and is a giant pain in the a$$. Making the pectin from the big goober ball of orange seeds and membranes was kind of cool. I had never made pectin before. 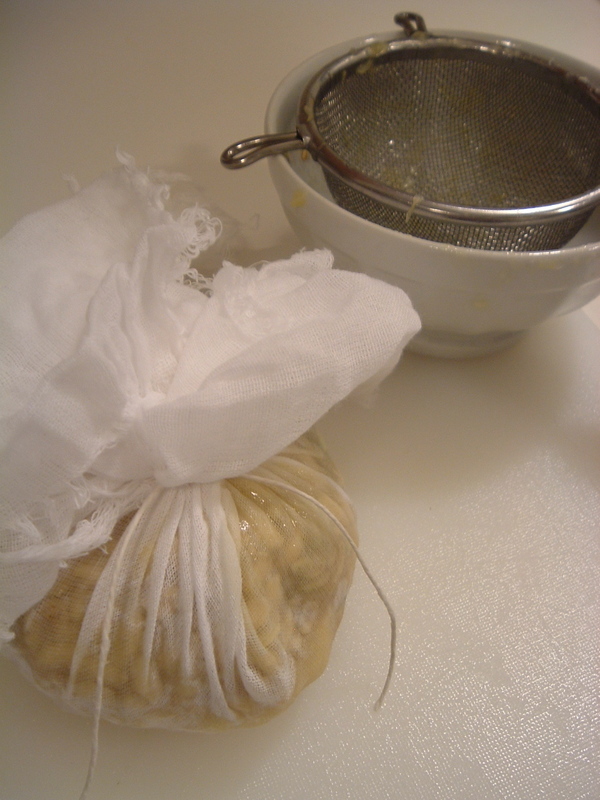 You boil the seeds in cheesecloth, then squeeze out the jell they form into your fruit. The marmalades set up beautifully. 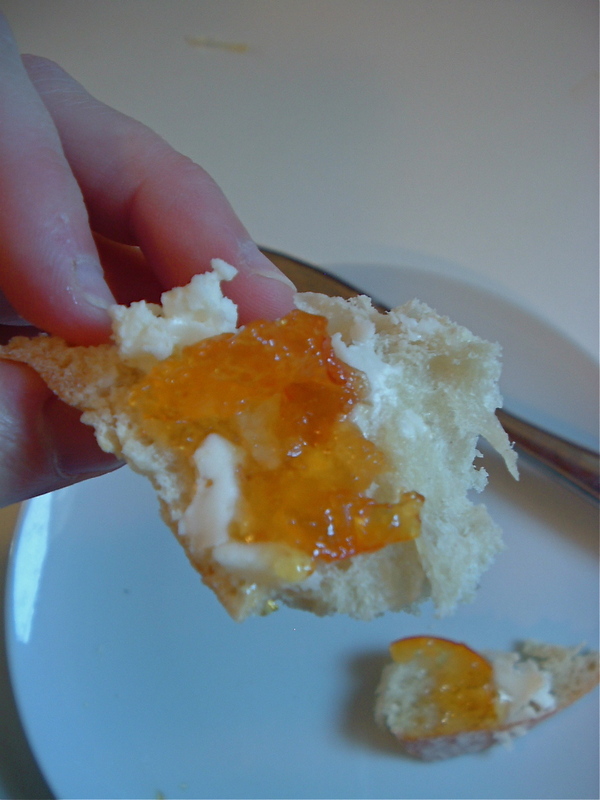 The recipes I used were slight adaptations of David Lebovitz’s Seville Orange Marmalade, and the Ball Blue Book’s Kumquat Marmalade. The kumquat recipe is much sweeter and less complex than the Seville orange, and it’s not just the difference in recipes. Lebovitz’s cooks much longer, probably twice the time. But if you think about the fruit, it also makes sense. Kumquats are kind of one-dimensional. I think I’d mix them with Sevilles if I ever make marmalade again. Which I probably won’t. I actually have a blister on my chopping finger. A blister! Look at those ragged cuticles! Woe is me! Woe! All right, fine; don’t feel sorry for me. 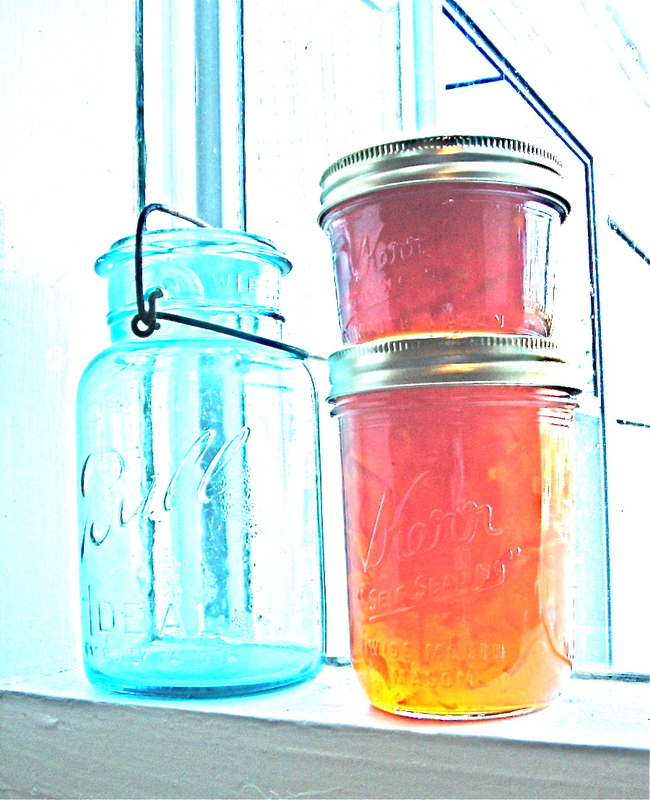 I’m going to go eat some marmalade and think about sweeter times ahead. Yes, I’m still here. I’m crossing my fingers that the car will be done tomorrow, since school starts on Tuesday and I have to teach in Corvallis at 11. Yikes. But I’m trying my hardest not to suffer my remaining hours in Ol’ ‘Frisco. Alembic in San Francisco might be my favorite bar in the whole world, well, other than The Alley in Oakland (“Of all the pretty cities she’s the lead-a / and don’t forget the tube to Al-a-meee-da”). But that’s a whole different ball of wax. For the past three nights, we’ve been drinking Alembic’s bar manager Daniel Hyatt’s Southern Exposures, or rather, my poor attempts thereat. Alembic’s menu urges us to drink plenty of Southern Exposures, since, being a mix of celery juice, lime, mint and sugared gin, they are full of anti-oxidants. Or so I am willing to believe. This drink surprises *everyone* with its really mild notes of fresh celery, which makes the mint more herbally than mojito-ey, and the slightly sweet, punchy taste. It makes a lovely aperitif or a brunch drink for those of us who don’t care for the heavy, sluggish tomato of a Bloody Mary. I don’t have my camera here, or I’d take pictures of the drink, which is a gorgeous green. You can see a small photo in the article The San Francisco Chronicle recently ran, which was really a profile on Hyatt, including the recipe for the drink. Hyatt describes how he developed it from a classic Southside by adding the brilliant jolt of celery juice. We were out of limes and lemons by this point in the New Year drinkfest, so I dipped into my exotic citrus stash (which I bought for marmalades once I return home) for meyer lemons. I found that the aromatic and mild juice this lemon yields works differently from the celery, creating a more integrated flavor profile, since celery and lemon marry so well. When compared to the lime version, though, it was clear that the drink was perfect as is: zippy and vibrant. I experimented with Martin Miller gin, since I find it absolutely delicious with its floral, coriander, and cucumber notes. There’s nothing at all wrong with Junipero gin, which is in the original cocktail, but the MM brings more to the party, if you ask me. Also absolutely amazing, if you can find it, which you likely can’t: the singular celery bitters made by The Bitter Truth, a German company, that isn’t yet distributing widely in the U. S. The company’s website can ship a bottle for 11 euros plus another 13 euros for shipping — no thanks. We found ours at Cask, just south of Market down the street from the SFMOMA, for the somewhat less financial crisis-promoting sum of $20. Bartenders get it at trade shows. I’ve sent unsuspecting friends on wild goose chases to find it in London and Berlin, to no avail. Be warned. But if you can get it, OMG. A fantastic drink lifts off into the stratosphere of stellar. Making the celery juice is the only real pain, but since this drink is meant to wow people, you won’t be disappointed by the effort. Make the celery juice, using the freshest, darkest celery you can find. Cut 1/2 of a small bunch of celery (including some of the leaves) into 1-inch pieces and pulse in a food processor, adding a bit of water if necessary. When the celery is pulped, grind out the juice in a food mill, or fold pulp into a double thickness of cheesecloth and squeeze well. You should have several ounces of juice. Combine all ingredients in a mixing glass with ice, shake vigorously for 20 seconds, then strain into a cocktail glass. Hyatt’s original recipe says to double strain, but I like the flecks of mint that result from bruising and disintegrating the leaves when you shake with ice. Float a single dash of celery bitters on top, and garnish with a single, tiny, perfect mint leaf. Variation: substitute 2/3 oz. meyer lemon juice and a single fresh lovage leaf for the lime juice. With a nod to Jeffrey Morgenthaler and with deep shame to Robert Hess, whose recipe I use, I present to you a good drink idea gone terribly wrong. I have been drinking French 75s as I cook lately (that is, when I’m not working my way stoically through local budget semi-dry Rieslings — don’t ask). They make me tremendously happy: bubbly, giddy, tipsy, all that. In my continuing intrepid journeys into food blogging, I came a recipe for roasted lemon syrup in a forum somewhere, and I got so immediately excited I rushed out to turn all my lemons into roasted, sugary mush. Roasted lemon syrup, I thought, would make a fantastic French 75! 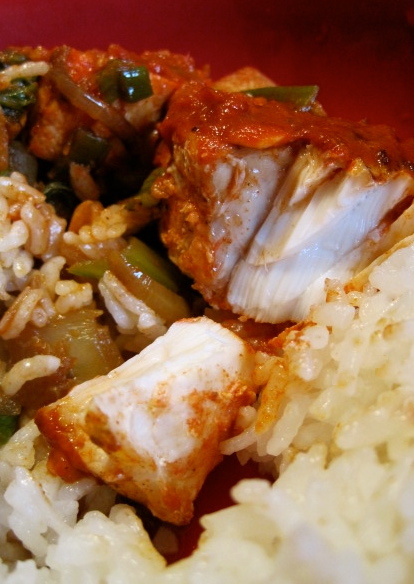 8×8, Pyrex dish with deep sides is best). Pour a cup of sugar over the lemons and then almost completely cover the lemons with water (this is why you need the deep dish). Carefully place in an oven preheated to 400 degrees, and roast until you have some black tips on the lemon and the sugar is syrupy and golden, about 45 minutes. 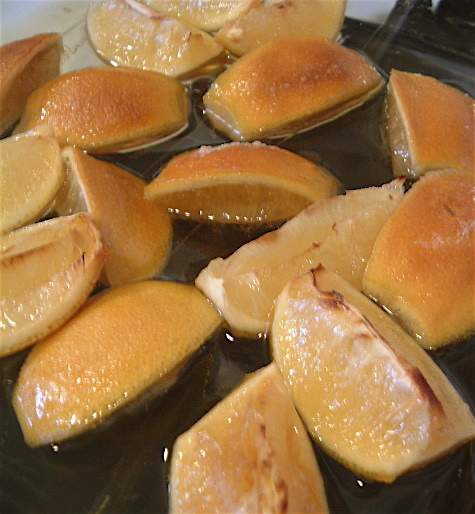 Note that the picture has lemons with the peel-side up — don’t do this, as it makes the peels too hard and dark. When the lemons are roasted (and it’s not an exact science, so just judge by sight), cool them down a bit, then pour all the syrup into a food processor bowl Remove all the flesh from the lemon quarters and add to the processor bowl. Chop up a couple of the quartered rinds, too, for some bitterness, and add to the bowl. Puree until chopped to little bits, then strain in a medium-coarse mesh strainer, pressing on the solids to release all the liquids you can. 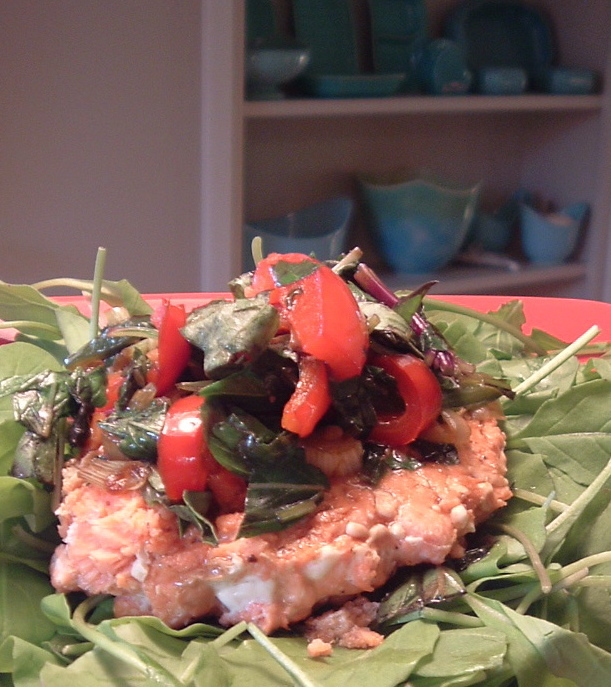 Pour into a clean bottle and store in the refrigerator. I wouldn’t keep this as long as simple syrup, but it can keep for a while. You can use this syrup in drinks and in spritzers. I was so excited by the idea of a roasted lemon French 75 that I skimmed a bit off the top without straining and added 3/4 oz or so to my standard mix instead of the lemon juice and simple syrup. Sounds great, right? Nooooooooooo. The sweetness of the champagne clashed with the bitterness of the lemon peel and ate up the sugar smoothness of the syrup, making it taste like saccharine. I added more syrup, thinking the sugar balance was off, and it oozed down the sides the the flute, leaving a trail of slime. 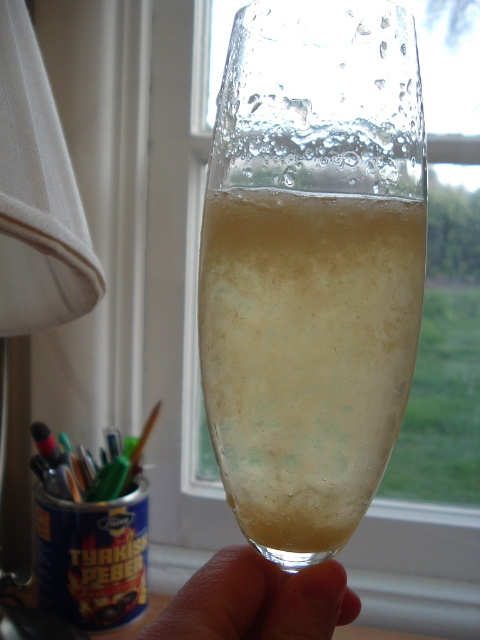 Worse yet, the bubbles in the champagne put the bits and chunks of lemon pulp into motion, circulating them like a monstrous brew of polluted stream, over and over, in my glass. And the color — o horrors, the color — it was not the pretty lemon yellow of a French 75 but a darker, muddier sludge that resembled nothing but some revolting bile. Bottoms up, I said, and gamely drank it down. Looked like bile, tasted just as bad. 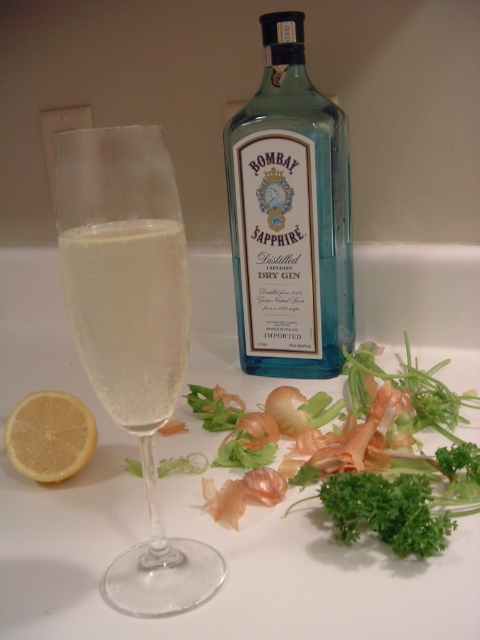 So I post it herewith, so the entire French 75-drinkin’ blogosphere (all two of you) can learn from the error of my ways. Save your roasted lemons for something else: a French 75 insists on fresh squeezed.